Maybe you’ve had a YouTube channel for a while but haven’t seen much traction, or, you’ve just launched your first video. So now what? Today, 77% of the United States alone is using social media, and as any successful YouTuber will tell you, the most beautiful, well-done videos don’t mean anything without views. In this article, we break down 7 YouTube social media strategies that will help take your YouTube channel to the next level. 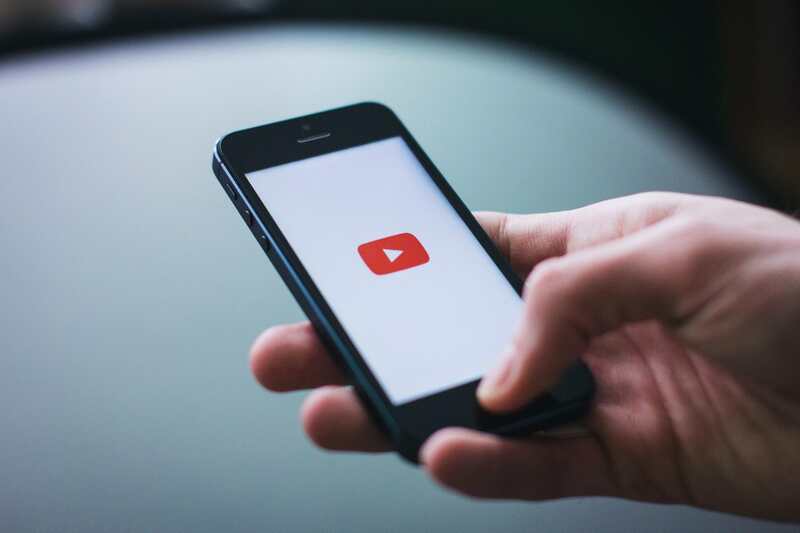 In order to be successful with YouTube, we first need to take a step back to the basics to understand what exactly YouTube is and why your business needs it. Not too long ago, companies paid a lot of money to produce and air their TV commercials to reach potential customers. According to Brandwatch, by 2025, half of the viewers under 32 will not subscribe to a pay-TV service. So, who is to the blame for TV’s slow death? YouTube. Unless you’ve been hiding under a rock for the past 13 years, then you already know about YouTube. YouTube boils down to one simple concept: video sharing. YouTube’s free video sharing platform allows individuals and businesses to upload and share their videos with the world. Today, YouTube has 1.8 billion active monthly users and 1 billion hours of videos are being watched per day, according to TechCrunch. Chances are your potential customers are already on YouTube just waiting for your videos to reach them. Who am I targeting with my YouTube videos? In the remainder of this article, we will be focusing on the third topic, and arguably the most important - promotion. Why are you starting a YouTube channel? What is your motivation? Perhaps you want to teach people how to do something. DIY videos and tutorials are popular ways to grow followers. A great example is Home Depot’s “how to” videos, with 190,000 subscribers and close to 1,500 videos. Their intent is clear, they give people what they want - how to get things done around their home. Or maybe you want to make people laugh or tell interesting stories through your brand. Whatever type of YouTube content you want to deliver, you should define a motivation and be consistent. Consistency helps with user expectations, branding, and quality control. It is possible to have multiple video types (i.e. DIY, product reviews, etc) but this is where consistency comes in. Creating good videos can require a lot of time, money, and effort, therefore, a consistent and realistic production schedule is key to maintaining quality. A good idea is to upload an introductory video to your YouTube channel presenting you or your company, your videos’ intent, and your posting schedule. Some companies choose a particular day of the week and brand it such as “Fashion Fridays” to post their latest videos. Furthermore, when it comes to sharing your videos on social media, this should also fall into a consistent schedule. Whether you create videos about travel, teaching people a language, or social media tips, chances are someone else is already doing it. This is where you, your brand, and your content really need to shine. Take a look at your competitors, what are they doing? Can you find a different angle? Let’s take a look at a mundane product such as a blender. How many companies sell blenders? How could you find a unique angle for a YouTube video? Well, BlendTec found one and now the BlendTec YouTube channel has 880,000 subscribers. Consistent branding is also extremely important. As your video gets promoted on social media channels and shared through the web, you want to let people know where it comes from. Logos, colors, and even using the same actors will help differentiate your videos. Why should people subscribe to your YouTube channel if customers and fans already follow you on Facebook, Twitter, and Instagram? Your YouTube videos should offer something compelling and unique that they cannot find on your other channels. Let’s say you own a women’s beauty company but only share tips and “how to” tutorials on hairstyles and makeup on your YouTube channel. This gives fans a reason to subscribe to your channel because they can’t find it anywhere else. Is YouTube considered social media? Yes, so make it social! With 2.23 billion active monthly users on Facebook, 1 billion on Instagram, and 330 million on Twitter, cross-promotion is the best way to spread the word about your YouTube channel. If you have a loyal following on Facebook or Instagram, then you already have a prime audience waiting to watch and share your video content. You can use a build-up method to create excitement and curiosity about your YouTube channel before fully introducing it to your followers. Maybe you want to spark excitement around the launch of your YouTube channel dedicated to “RV Vagabonding”. You can use teasers or images of life on the road asking fans, “what would you do in this situation”? A successful tactic is to promote your YouTube video using teasers. These are small, shorter clips of your full YouTube video that give your followers some of the information they want, but not all of it. Yes, exactly like a movie trailer. For example, maybe your teaser video shows the ingredients and final product of a beautiful Nutella cheesecake, but to get the step by step cooking instructions they need to click on the YouTube link that directs them to the full video. We recommend using the Native Video Uploader tool to upload your YouTube videos on Facebook. In the video, add a call to action inviting them to subscribe to your YouTube channel and to boost audience engagement. Don’t forget to add a link to your YouTube channel and a text call to action. In addition to sharing your videos on social media platforms, they should also be featured on your website. 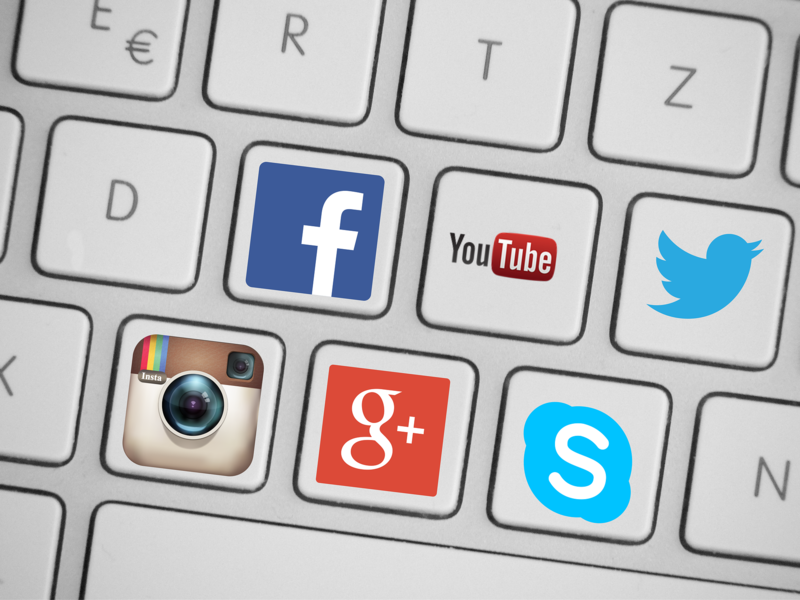 While there are many ways to embed your YouTube channel on your website, a social media aggregator will give your viewers a complete picture of your social presence and drive more traffic to your social channels. Juicer’s social media aggregator pulls content, videos, images, and hashtags from all of your social channels like Facebook, Instagram, Twitter, and YouTube into one beautiful feed that can be embedded onto your website. Within the Juicer dashboard, you can add your Youtube channel URL as well as any user’s YouTube channel or particular playlist, so if you want to feature videos from other sources, those will automatically be posted to your website feed as well. All of the comments, posts, and shares of your YouTube videos across all your social channels will be displayed so none of your viewers miss out on the buzz. You can sign up for Juicer’s social media aggregator and try it out for free. Your fans comments are the best way to connect with them and improve engagement. When you respond to people and engage them in conversation it makes them feel valued and respected. When people feel connected to you, they are more likely to share your video and continue following your channel. For videos or social media posts that have thousands of comments, it can be extremely time-consuming to respond to each one. However, making an effort to respond or comment back to even 1/4 of them shows viewers you are human and you are putting in the effort to connect. You can also use fans comments to get feedback on your videos. Ask them for suggestions or areas of improvement, and if they like your video, to share it. We engage with customers to grow our follower base, so don’t be afraid to ask them to share their comments. For a great example of audience interaction and engagement, view the Starbucks Twitter feed. Unfortunately, not all feedback is positive. Sometimes people share comments that we may not like to see - but it's a bad idea for a brand to ignore criticism. Instead of ignoring those comments, listen to them. Is there something you can be doing better? While it's tempting to say, 'well, it's only one bad comment' - the reality is that it's a bad comment from someone who took the time to share it. A lot of customers will simply find another company to do their business with. Instead, see what you can learn, apologize to the customer, and do what you can do to address their concerns. 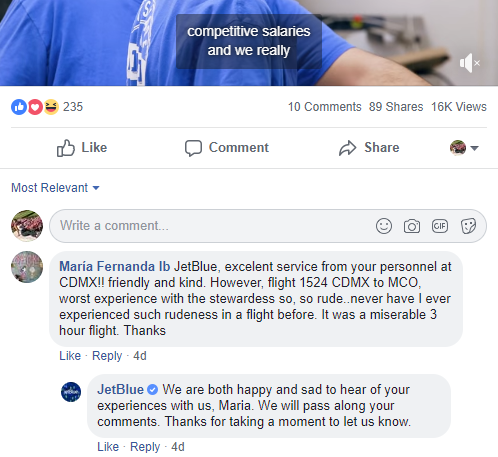 Here you can see JetBlue getting some somewhat negative feedback in one of their video thread comments on Facebook. Instead of ignoring the fan, they apologized and validated her concern. 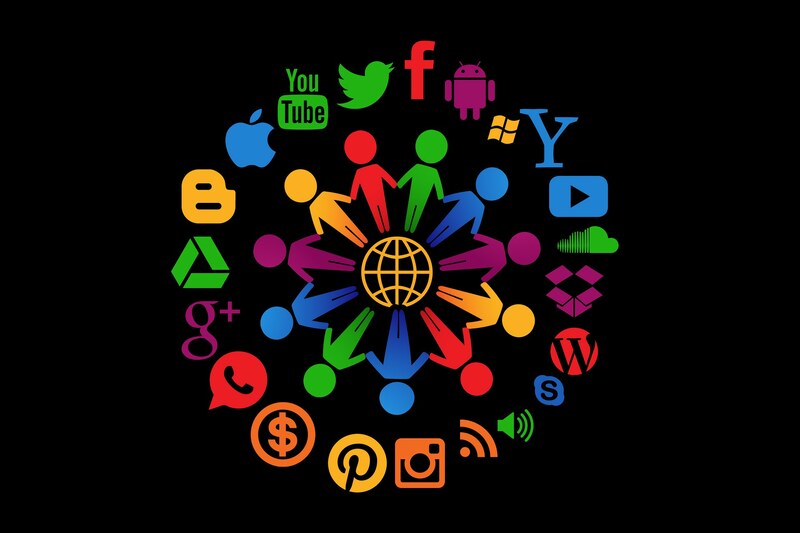 In the digital marketing world, connecting with influencers and getting your content shared by others in your industry drives traffic and gives you credibility. It works the same way with YouTube marketing. Cross promoting videos is a win-win effort where both parties mutually benefit. Search for companies or YouTube influencers within your niche or one that aligns well, ideally with a bigger following than you. Making a video together or sharing each other’s videos on social media can drive a whole new audience to your YouTube social network. A video thumbnail is like the cover of a book, it can motivate you to open it or move onto the next option. A thumbnail is a static image example of your video’s content. It is what is shared, displayed in searches, social media channels, and websites. According to marketer Neil Patel, clean and attractive thumbnails can increase your engagement by 154%. Matt Komo, Head of Social Content for GoPro does a great job at producing simple, obvious, yet beautiful thumbnails that pique the interest of the viewer. He uses enticing images and simple words that tell you what the video is about. - Be optimized for mobile. Picture this, you’re at work and your boss is hovering around. Your phone buzzes as a friend shares a video in your chat group, and all of your friends start commenting about it. You want to watch it too. So you shut off your volume and click on the video. Wait, no subtitles? According to YouTube, 50% of their videos are viewed on a mobile device. Many people may discover your videos while browsing social media from their cell phone - and depending on their surroundings, they may watch them on mute. If you’re cross-promoting your YouTube videos on Facebook, Instagram, or Twitter, be aware that your viewers may never actually hear it as many social platforms may mute audio as a default setting. This is why having subtitles is so important. Your text should be large enough to clearly see on a tiny screen (cell phone), but short enough so that you’re not producing paragraphs. Keep text to the point and at a minimum to get your message across. YouTube success isn’t made overnight, it takes time and a lot of trial and error to get it right. However, If you stay consistent, work hard, and follow the YouTube social media strategies above, you will be well on your way to growing a more successful, loyal following. What strategies have helped you grow your YouTube channel? Share with us in the comments below!